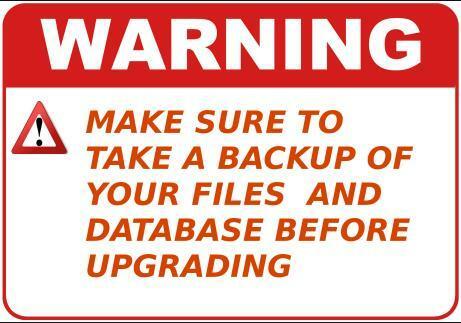 Taking a backup of the existing system is always important before playing with it. It will make sure that you can always revert back if anything goes out of the regular flow. OpenCart files:First download a copy of your OpenCart files from your web-server and keep it on your local computer system. You can download the files either using the Cpanel of your web-server or an FTP client like FileZilla. 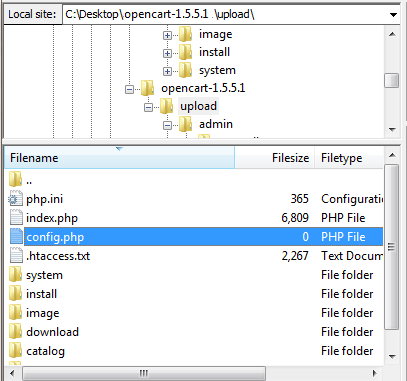 Generally the files of OpenCart are located at /var/www/html but this might be different too. In order to have a look at the same you may open the config file from /etc/httpd/sites-enabled (on Redhat or CentOs) or /etc/apache2/sites-enabled (on Debian, Ubuntu, Mint based servers). Read more about how to edit files on Linux and what does Apache Config File mean. 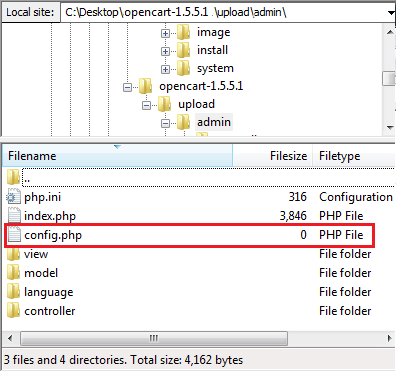 Database: You can export the database of your OpenCart store through phpMyAdmin (Learn in 5 steps how to install PHPMyAdmin). Alternatively, you can create a backup directly from OpenCart dashboard >> Tools >> Backup/Restore. As specified in the beginning itself, you can get the latest version of the OpenCart from its official download page. Download the latest version showing on the page. After the download, you will see a Zip file. Unzip the file on your system where you can easily access it (How to unzip a file on Linux). There are two ways using which you can upload the file on your web-server. PS: You will be asked to handle the file names during the upload process. Here you need to choose to overwrite and apply it for the current queue. 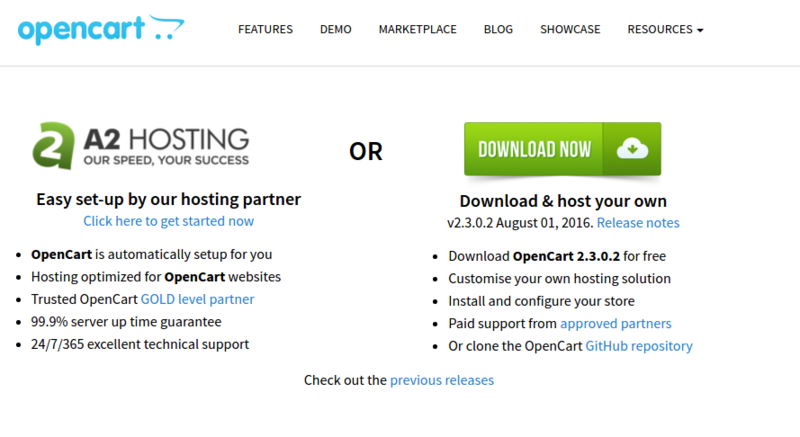 In this way, all the files in your existing OpenCart folder on the web-server with the same name will be overwritten with the new files from the latest OpenCart version you are uploading. Caution: In the unzipped folder of the latest OpenCart version that you have kept on your computer, make sure you have found the ‘upload’ folder. You need to upload everything from this folder to the web-server, except for two files that you need to skip uploading. Do not upload “upload/config.php” and “upload/admin/config.php” from your unzipped folder to the web-server. If you override these files then your OpenCart site might stop working. You may always edit the new Config Files though. Open your browser and enter your domain address followed by /install/ after the domain address (Site URL) and press enter. Say “www.yourstore.com/install”. 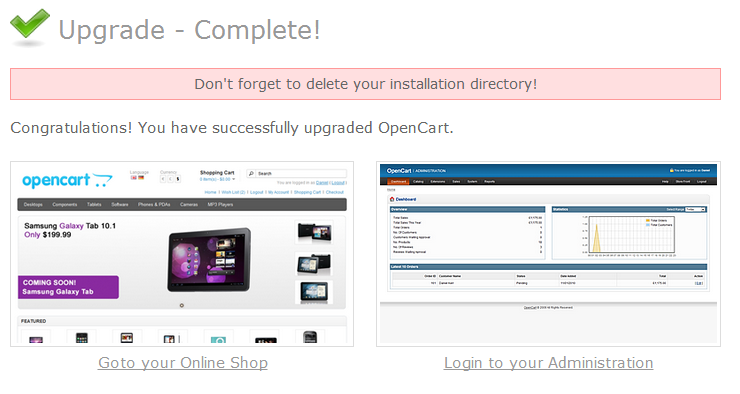 It will initiate the OpenCart auto-installer interface. Since, this is an OpenCart update, not a fresh installation it will have only a few steps. After completing the install procedure, you will see the following page indicating that your upgrade is complete. Clear browser Cache by Pressing CTRL+F5 three times both on Admin and Front side of the store. Check the store settings and fill any information that is missing after the upgrade. a) Login into OpenCart Back office as an Admin user. b) Click the settings icon from Navigation Menu on the left side. Here, you need to provide the top Administrator group full permission to access as well as modify your OpenCart site. Select all permissions and save them to implement the changes. 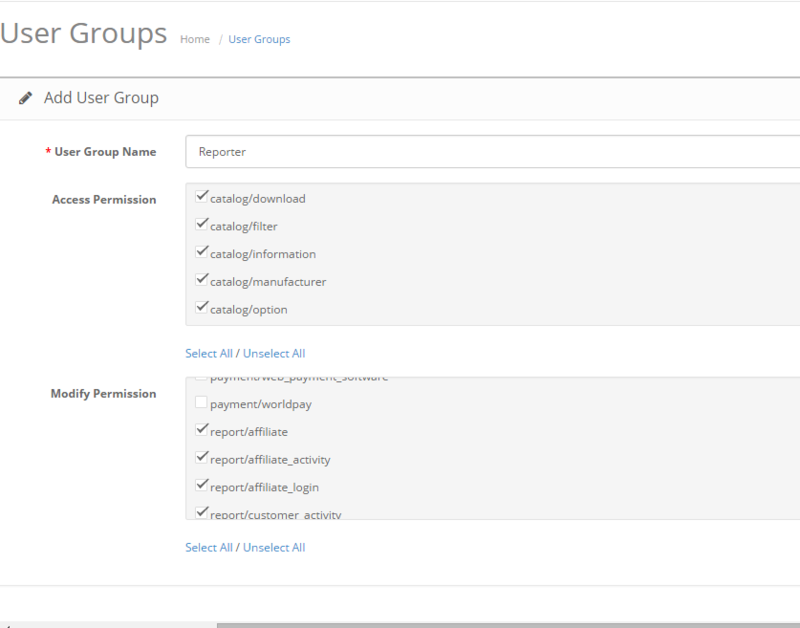 Once you have Made the User group and missing settings in order, your OpenCart store is ready to sell with the latest version of OpenCart. Upgrading the OpenCart version of a production site is a tricky task if it is not done carefully. It is recommended to have an OpenCart expert by your side to do this job, if you are not aware of the file structure and configurations of the latest OpenCart versions. Some OpenCart development services do include an upgrade service in their packages too. Their experts are generally aware of the working of all the OpenCart versions and their upgrade procedures. So, if you are already in touch with, you should ask them to perform the upgrade for you. This would make sure that your upgrade is done by an expert OpenCart developer, minimizing the chances of error.